Yochelson & Associates has helped many drivers, passengers, pedestrians and other victims of automobile accidents obtain compensation for their injuries. After a car accident, call 911 and see a doctor. If someone requires emergency medical care, paramedics should be called without delay. Any concerns of lesser importance may be taken care of once help is on the way. If you feel that you’ve suffered an injury, your first and foremost concern should be your health. Even if you believe that no one is seriously hurt, calling the police to the accident site is important for any accident. After the police and/or paramedics are in route to the scene, you should wait for them to arrive so they can help exchange contact and insurance information with the other drivers/witnesses involved. In the meantime, take pictures of the accident and surrounding area and make a note of the time and any details that seem relevant. It is better to take too many pictures than not enough. After the insurance and driver’s license information has been exchanged, most people have the misunderstanding that evidence gathering and preservation from a car accident has concluded. This, however, is not the case. It’s not necessary to try to collect ALL the evidence necessary to support your case. In fact, accident victims rarely have the knowledge and resources necessary to obtain some of the most important evidence in their case. Here are some tips that you can use to ensure that you have maximized your efforts. If you use our Auto Accident APP, this information can easily be captured and saved for future access. Copy down, or photograph, the license plate number of the other vehicle involved. Sometimes the person driving the car does not own the car. By writing down both the driver’s information and the license plate of the vehicle, you have worked to more thoroughly to obtain all the information that you might need in the event of litigation. If a police officer has come to the accident scene, be sure to ask if a report of the accident will be prepared and where and when it will be available. If the officer does not intend to prepare a report, be sure to request the officer’s name and badge number for later contact. Take pictures of the surrounding area to preserve the way it looked at the time of accident. If you or someone in your vehicle sustained a visible injury: i.e, bruise, cut, scrape, or stitches, take photograph(s) of the injury to preserve the state of the injury at the time of the injury. Feel free to take as many photographs of what you think may, no matter how trivial, be important to the accident. Your California car accident attorney will decide what is and what is not important. If you were a pedestrian, take photos of the crosswalk or the location where you crossed at street or where you were standing, walking, jogging, at the time of your accident. Take the name, address and telephone number of any potential witness and save this information someplace where it will not be lost. Our Accident App has a special section for this purpose. Revisit the scene of the accident several times at the same time at which the accident took place. Some people ma/y have a habit of visiting, stopping, driving, etc, by the location of the accident as part of their normal daily routine. You may able to find a witness. If you have obtained witness information, do not contact or speak to the witness(es) again. Do not try to solicit a written statement or any other information from the witness. Let your attorney contact any possible witness(es). After taking photographs of your damaged vehicle, take the vehicle for a repair estimate as soon as possible. You are not obligated to use a repair facility recommended by an insurance company to have repairs done, but it generally won’t hurt to get estimates from recommended garages. According to the National Safety Council, there are 10 million accidents annually. These accidents tend to range from backing into a neighbor’s car to massive pileups on the freeway. Many of these car accidents can often be avoided as distracted driving continues to be the leading cause. Research has shown that those who use a hand-held device, such as a GPS or a smartphone, are 4 times more likely to be involved in an auto accident compared to those who do not. 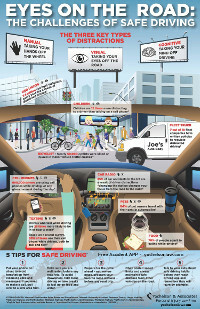 Eliminate distractions while driving, including the use of mobile devices. Phone calls and Text’s can wait. Slow down or move over for police, fire, EMS and tow trucks that are stopped on the side of the road with emergency lights activated – it’s the law. Also, show the same courtesy to fellow drivers stopped along the road. Monitor weather conditions wherever you are traveling. In the event of inclement weather, use extra caution on roadways, and never attempt to drive across flooded roadways or intersections. and not realize that your brain has been injured. 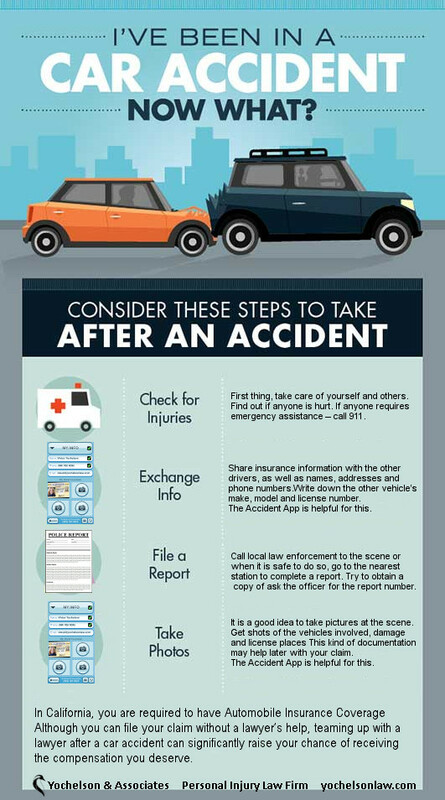 watch out for after an auto accident. Although you can file your claim without a lawyer’s help, teaming up with a lawyer after a car accident can significantly raise your chance of receiving the compensation you deserve. Insurance company representatives are trained to be friendly and sympathetic, and that may lead you to believe the insurance company has your best interest at heart and will take care of your needs. Unfortunately, this isn’t how insurance works. Insurance is a for-profit industry, and your “friendly” insurance company is looking to boost their own profits by paying as little as possible in claims. If you don’t understand how insurance companies operate, it can be hard to fight against their tactics, especially when they’re armed with advice from a whole team of lawyers. The best solution is to work with your own car accident lawyer, an experienced negotiator who knows the law and the games insurance companies like to play. An experienced California Car Accident Lawyer can stand up to the insurance companies for you to make sure you get what you rightfully deserve.